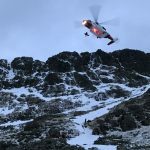 The Team immediately requested a winching helicopter in view of the likely seriousness of his injuries, and the Team members who were descending from the top of Nethermost were quickly on scene, along with three Patterdale team members. Other Team members were sent out from base to assist. A passing doctor also managed to get to the casualty quickly, but regrettably, the injuries the man had sustained were so serious that he didn’t survive. Rescue 199 from Prestwick attended the scene but was unable to winch in the very strong wind. The Team then stretchered the casualty down to Swirls car park to liaise with the police. Other Team members escorted the casualty’s partner down. Conditions in the valley give no clue to how difficult conditions will be at 800 metres. 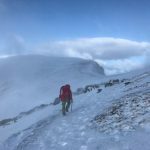 The Team cannot emphasise enough the serious challenge that the mountain poses in these winter conditions; snow patches have frozen to bullet hard ice, making crampons, and an ice axe to arrest any slip/fall absolutely essential. 22 Team members + 3 Patterdale MRT – 3 hours 9 minutes.